Indiana, like the broader U.S. pork industry, has taken some hits this year with thanks to tariffs from China and Mexico on “the other white meat.” This and other factors helped one economist make a 2019 forecast for national hog production. 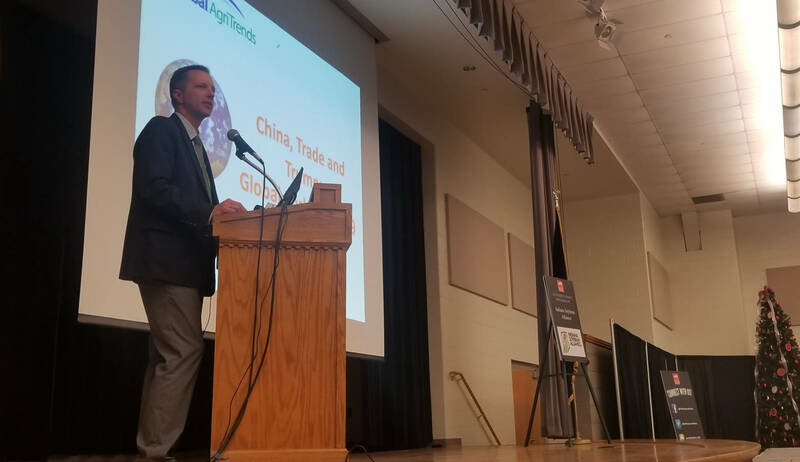 Speaking Tuesday at a conference on the industry, Global AgriTrends President and CEO Brett Stuart tallied a list of all the taxes the U.S. currently pays to ship pork to China. American hog producers have also taken a hit thanks to Mexico enforcing a 20 percent tariff on all U.S. hogs imported into that country. Looking at next year, Stuart forecasts pork production will be up next year, along with consumer demand. “Americans are going to eat a record amount of beef, pork and poultry in 2019. More than they’ve ever eaten,” says Stuart. Yet, he says there will still be a surplus and to keep per capita value steady, about 20 percent will need to be exported to other countries, which he doesn’t think can be done. He calucalates U.S. pork exports will increase, but not necessarily to China due to the ongoing trade disputes. Hundreds of pork producers attended this year’s Midwest Pork Conference in Hendricks County. Indiana ranks fifth in the country for pork production with about 3,000 hog farmers around the Hoosier State.